Bitcoin has continued it’s downward trend which the community has mainly attributed to the recent Bitmain announcement. Regardless of the reason, a flight to fiat is underway and bitcoin’s market cap has fallen to $38 billion. Altcoins have also moved lower to a $58 billion valuation but the combined market cap of bitcoin and altcoins is still slightly below $96 billion total. The altcoin market share is currently close to 60% of the joint cap (half of which is ethereum at $30 billion while ripple is a distant second nearing the $10 billion mark) with bitcoin holding the remaining 40% respectively. A continued reduction in the US dollar valuation of all crypto currency caps may additionally fuel more downward price volatility. The previous BitStamp trading range (from $2,668.48 to $2,802.59) broke down further to a new weekly low of $2,115, slightly above the 0.236 Fibonacci line, which is still holding despite severe sell pressure. The reverse pitchfork shown above was partially invalidated but can still serve to reveal an obvious descending channel that would need to be broken in order for a definite trend reversal. More time will be needed unless there is a dramatic increase in buying volume or a reduction in selling. Price would have to follow these adjusted dynamics as well. As long as the 0.236 Fibonacci line holds, bearish momentum should waver. 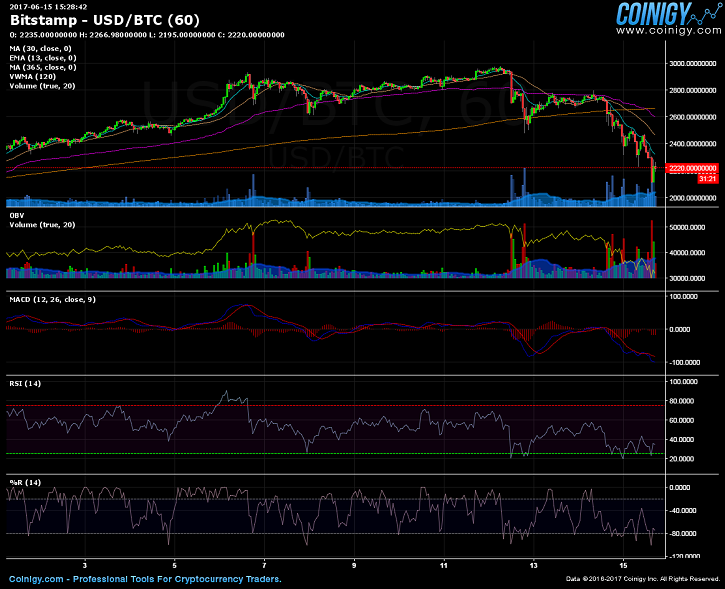 In case of a further breakdown, then a drop to $2,079.00 would be the first support level and the second at $2,000.98. A third support level would be at $1,848.00 and anything below that would constitute a drop of more than $1,132.00 (37.96%) from the previous all-time high of $2,980. The trading volume in the next few days should be a good indicator of further sentiment. 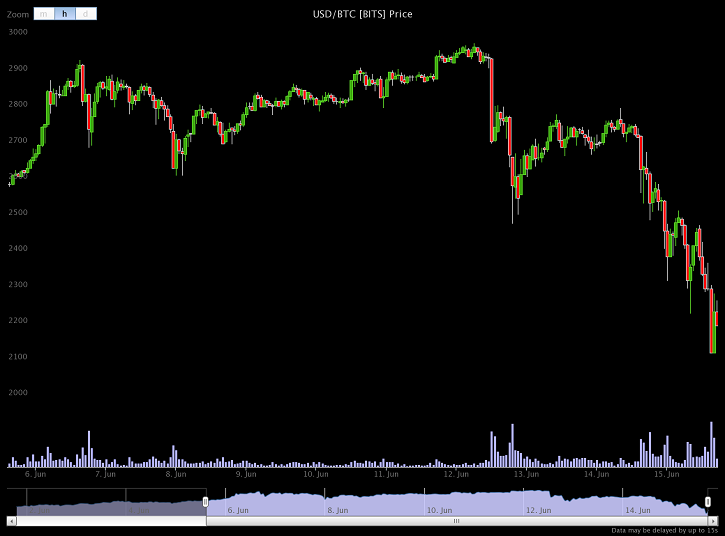 Hourly trading volume is rising at these lower price levels, so an increase during the weekend is to be expected. However if trading is relatively stagnant, then further bearish momentum should be expected on Monday, when most crypto currency traders collect profits or accept losses from weekend trading. RSI is showing to be oversold and has been adhering to the low 20s with the Williams %R indicator also following suit, being as it is highly oversold. 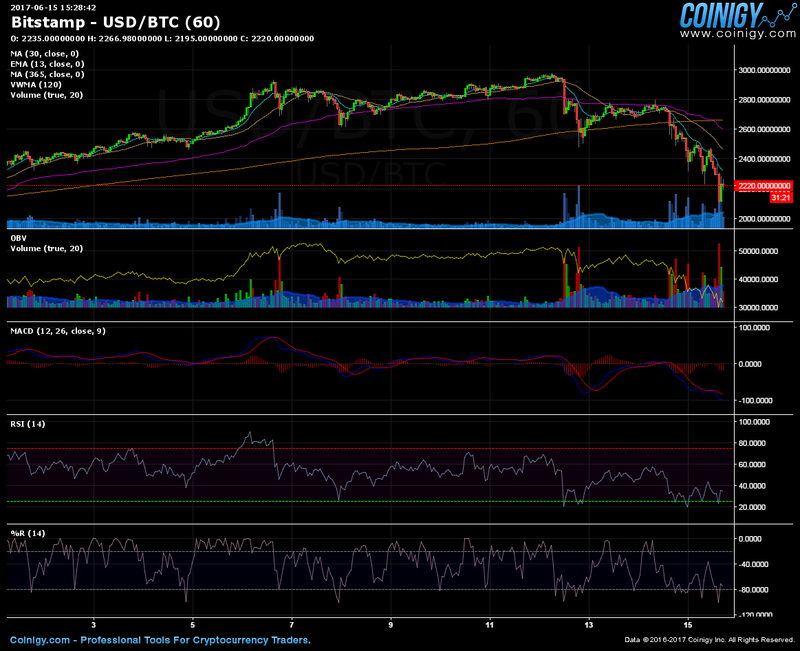 MACD is not diverging from the trend movement and is currently exhibiting bearish signals. OBV appears to be bullish, with increasing volume amidst dropping prices. BTC/USD started trading yesterday (13:30 GMT) at $2,755 and has since been in free-fall, achieving a new weekly low of $2,120 as of today at 13:55 GMT. Current market tendencies are highly bearish. Anything that will help reform and move traditional banks away from the current status quo is worth supporting in my book. Interesting times are ahead of us.